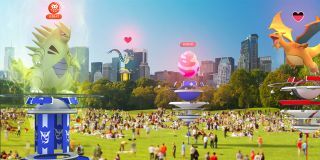 If the new Legendary Pokemon just got you back into Pokemon Go you probably need to know exactly what you'll be unlocking next as you eat up that precious XP from raid battles. As you know, Pokemon Go isn't just about the Pokemon you catch, it's also about you as a trainer, growing stronger and gaining access to more powerful items as you level up. So, to help you be the very best and plan ahead, we've posted the full list of rewards (as reported on Reddit on TheSilphRoad) all the way up to Level 40. That's a lot of XP to make your way through. Better hope you're catching more than Pidgeys. Check out the Pokemon Go level rewards below so you know exactly what's coming your way next and how far you've got until you hit your next milestone.